Here we will review the function, effects and benefits of eyelash tinting, as well as how long the procedure takes, how long it lasts and some other important considerations and warnings for those interested in eyelash tinting. Eyelash tinting temporarily dyes the eyelashes. This is done to achieve the look of wearing mascara without having to apply makeup daily. The dye used to color the lashes black is usually a vegetable-based dye. This is to minimize the irritation around the sensitive eye area. However, this is also a reason that eyelash tinting does not last permanently. The entire lash tinting process takes approximately ten to fifteen minutes. First, special stickers are placed around the eyelids to prevent the dye from reaching the actual eye. Next, the dye is applied carefully to the upper and lower lashes. The dye must then set for at least five minutes to penetrate the lashes. Finally, the dye is washed away and the lashes are left darker. Since lash tinting is done with vegetable-oil based dyes, it is not a permanent solution. The lashes will stay dark for about 3 to 5 weeks. Lash tinting is not currently approved by the FDA. This means that it is very important to do research on a good salon that is qualified to tint your lashes, since it is not federally regulated. Also, there are a number of different dyes, and the prices for this procedure vary quite a bit. The average cost is about $25, though many salons charge as little as $15 while others charge as much as $40. Women who regularly get their eyelashes tinted enjoy a number of benefits. If your lashes are naturally blond, getting them dyed will create a much more dramatic look for your eyes. The best part is the benefit is around the clock; unlike mascara that you must apply every morning, be careful not to smudge, and wash off at night, with dyed lashes you wake up looking like you already have makeup on. Lash tinting is a great option for women who have busy or active lifestyles. If you spend a lot of time swimming, playing sports or chasing your kids around, it's likely that you do not often wear mascara. Lash tinting will give you a more polished, coiffed look that is also no-maintenance. 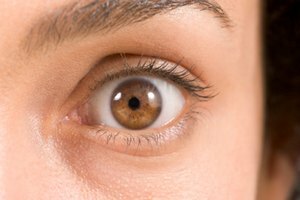 Though eyelash tinting can seem like an easy way to enhancing the look of your eyes, it does not come without its warnings. If you choose to get your eyelashes tinted, be sure that the salon is reputable and has a long history of successful eyelash tinting. Do not go to a salon that has just introduced eyelash tinting on its menu of services--this likely means that the esthetician recently learned how to do the procedure. Visit a pro who has been doing it for years instead. In extreme cases, eyelash tinting has been known to cause temporary blindness and severe reactions of the eye. At very least, many women who get their eyelashes tinted experience stinging and watery eyes. This is why it is especially imperative to select a qualified salon that comes highly recommended for eyelash tinting.